“It was a rollercoaster and everything feeds into that then, your diet, sleep, hydration and all that,” the Galway captain said. GALWAY CAPTAIN DAVID Burke has revealed how some players got up at 3am to treat injuries in an effort to be available for matches during the summer. The 28-year old said that the All-Ireland semi-final replay against Clare, having also drawn the Leinster final against Kilkenny, took its toll in a summer which ran to nine championship matches for the Tribesmen. “With the two replays it was hard. Physically, the medical team and all the backroom did a superb job getting lads right,” Burke told Galway Bay FM. “Then there was the mental high from a game, getting down off that maybe by Wednesday and then on Thursday and Friday get ready to go for the next game at the weekend and that was probably the most demanding thing but it was the same for everyone really all year. “For a player you want the games but if we didn’t have the two replays I was probably the ideal championship. We didn’t use it as an excuse, we said this would be the championship to win. “It would have shown up a lot of people who were doubting the team, it would have been the one to get over the line. It was a rollercoaster of a summer, just game after game,” he added. Burke, a teacher at St Brigid’s Vocational School in Loughrea, said that the frequency of the matches made for an intense summer of action. “It’s like you are in a bubble, it’s a way of life and it’s natural to us. It’s all about recovery. The week in between the Clare drawn match and the replay, the bodies were really struggling to get back. “Lads were going 24/7, lads were getting up at three o’clock in the morning to ice legs, hamstrings, calves and the bruises, and going to the sea twice a day, going to physios twice a day…it was really just phenomenal the stuff lads did just to get back on the field again for the following week. “It probably did take a toll on the bodies, freshness-wise, but we won’t use it as an excuse, that’s the stuff that goes on behind the scenes. It’s all about getting ready for the next session and these lads don’t want to miss a training session because if they do they think they are going to miss out on starting a game. The St Thomas clubman admitted that an All-Ireland final defeat is hard to take but he congratulated Limerick on their deserved success. “You grow up winning and losing games all your life but there is a big difference between winning and losing an All-Ireland final. It will take time to get over it but we will dust ourselves, refocus and go again. “Limerick set down their agenda from the start and it took us some time to get to grips with it, a lot of unforced errors when we had possession of the ball and probably led to big scores for them. “Their intensity and their work-rate outshone ours on the day. Their six forwards and two midfielders when they didn’t have the ball they worked like dogs to get it back and that probably set the terms of engagement for the whole day. Burke was proud of the way his men battled back against Limerick and says they will learn from the bitter experience and come back stronger next season. “The lads fought right to the end and never dropped their heads. They have been outstanding all year and really put their bodies on the line. Nine games, it’s probably like two championships. We had the round robin, then a break, then the Leinster final, the Clare games and then this. 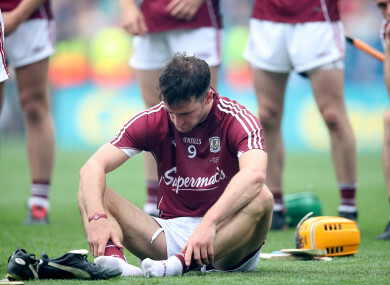 Email “Up at 3am to ice injuries, going to physios twice a day - Burke reveals toll of Galway's nine-game run”. Feedback on “Up at 3am to ice injuries, going to physios twice a day - Burke reveals toll of Galway's nine-game run”.